The Hellbender can be used in several ways. When set for low gain and a relatively clean sound the Hellbender can give a harder rocking edge to an otherwise clean amp. The high output level available from the Hellbender also allows relatively clean, low gain settings to be used as a cleanish boost. (For a true, totally clean boost use the Atomic Booster pedal.) 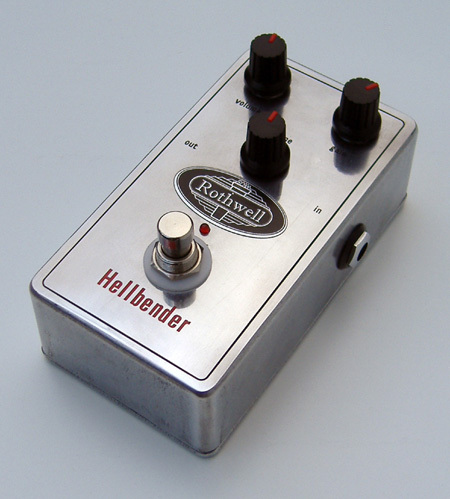 When used in conjunction with an amp which is already set for some distortion a slightly distorted boost from the Hellbender will give a volume lift and create more distortion without completely overiding the existing tone. At high gain settings the distortion available makes singing lead tones with enhanced sustain possible. The volume control can be set so that it lifts the output level to push an already distorted amp into very high gain territory. This combination of pedal distortion, signal boost and amp distortion can be balanced to create the right blend of saturation and dynamics. The Hellbender features true bypass switching. This leaves the guitar completely isolated from the circuit when the unit is bypassed so that your raw guitar tone is not affected in any way. Checkout the sound samples below. All samples were recorded using a small class A valve amp (1 x ECC83 pre-amp valve, 1 x EL84 output valve, custom made by Rothwell Audio Products) driving a 10" Celestion speaker, close mic'd with a dynamic microphone. No EQ used at mixdown. Bluesy/space rock lead tone, strat (bridge + middle pickups), Hellbender gain control set to 12 o'clock, tone set to 12 o'clock. Blues/rock 12 bar rhythm tone, strat (bridge + middle pickups), Hellbender gain set to 9 o'clock, tone set to 2 o'clock|. Soft rock/pop tone, strat (neck pickup), Hellbender gain set to minimum, tone set to 11 o'clock. High gain lead tone, Gordon Smith guitar (2 humbuckers, Les Paul style), Hellbender gain set to 3 o'clock, tone set to 3 o'clock. Live Video - Cold Shot are a Stevie Ray Vaughan tribute band. This is a youtube video link showing the band demonstraing Rothwell pedals at a guitar show in Manchester, England. Geoff Garcia, guitarist, is using a Hellbender. Notice how the Hellbender enhances the tone of the guitar and pushes the amp harder rather than superimposing too much of its own sound on the guitar. The cost is £139 and units can be purchased from our UK and international dealers (see dealer list) or from our online shop.